If you have not watched No. 6-ranked Mill Creek yet, and you enjoy good offensive line play, then you are missing out; the Hawks might have the best O-line in the state. 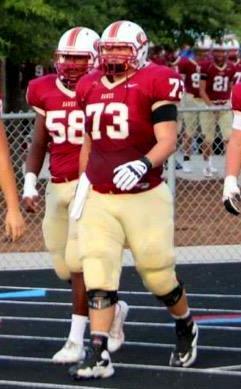 Leading the way is Tyler Fannin (6’3”, 290 lbs), maybe the best center in the state of Georgia and a big reason why Mill Creek is starting the season off undefeated. The recruiting buzz is just beginning for Tyler (class of 2017), but the process is nothing new to the Fannin family. Football runs deep in the family. Both his dad (played at Marshall) and his brother Josh (currently a freshman at Middle Tennessee) have college football backgrounds, and that talent has certainly been passed down to Tyler. Florida State is not the only school interested in the Mill Creek lineman. He plans on visiting Duke, Clemson, Old Dominion and Marshall (his lone offer to date) this fall. He told us that “Marshall, Duke, MTSU, Clemson, FSU and Northwestern” currently stand out. Making a decision is not something he is taking lightly, and football prestige is not the only option he is weighing. When watching Tyler on film you can see the fruits of his hard work. He consistently dominates his opponent and displays good leg drive. Tyler might not work at IHOP, but he still serves up pancakes every Friday night. The Mill Creek junior’s goal this fall is to be considered one of the best linemen in the state, southeast and country. For his team, he expects to win his region and make it to state.